Unspoiled scenic beauty coupled with the cool atmosphere of the mountains, have been hypnotized the visitors who come to Angseri hot springs. 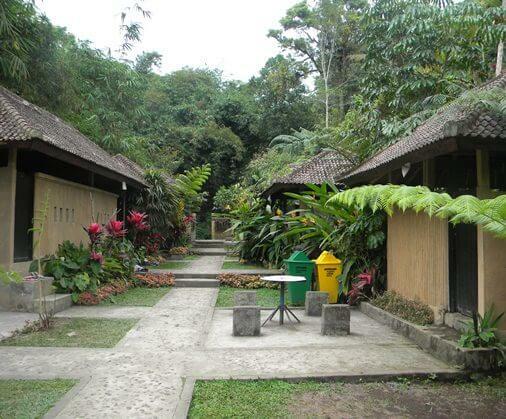 Located at the foot of Mount Batukaru, this hot spring is surrounded by the scenic beauty of rice terraces, bamboo, ferns and other tropical forest plants. The location is quite far from the urban hustle, still enveloped by the atmosphere of the calmness and natural coolness. 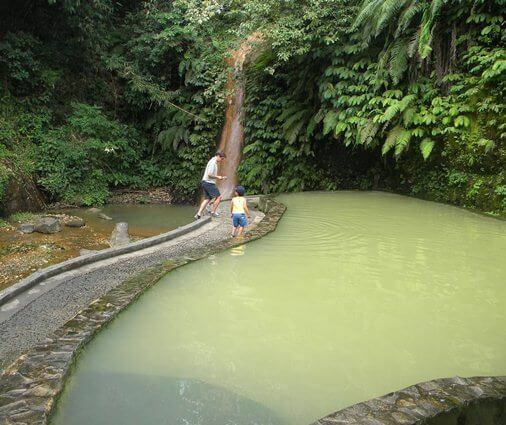 This hot spring is located in Angseri Village, District of Baturiti, Tabanan Regency, Bali. Trip to the hot spring location is quite far from the city, so visitors need a little patience. Ranging from road conditions, length of travel time and walking down the footpath from the parking location to the hot spring pools. But the natural scenery, the fresh air and coupled with the sensation of a soak in a natural hot spring, will pay all of your laments. The surrounding area of the hot spring is also supported by the arrangement of the beautiful landscaping and neatly arranged for the comfort of every visitor. The natural hot springs are formed by the emergence of geothermal heated groundwater and rise through the Earth's crust. Throughout the century, people have enjoyed this natural wonders for their scenic beauty, scientific value, and mysterious natural healing powers. The heated water in the natural hot springs can hold more dissolved solid minerals than cold water. Often, it has a high mineral content, containing everything from simple calcium to lithium and even radium. Therefore, the hot spring water plays an important role as therapeutic water that provides many benefits particularly to sufferers of ailments such as psoriasis, eczema, dandruff, warts, shingles, and muscle aches. In addition to eye refreshing, visitors can also get benefit by soaking in the hot spring pools for both relaxation of mind and your body health therapy. 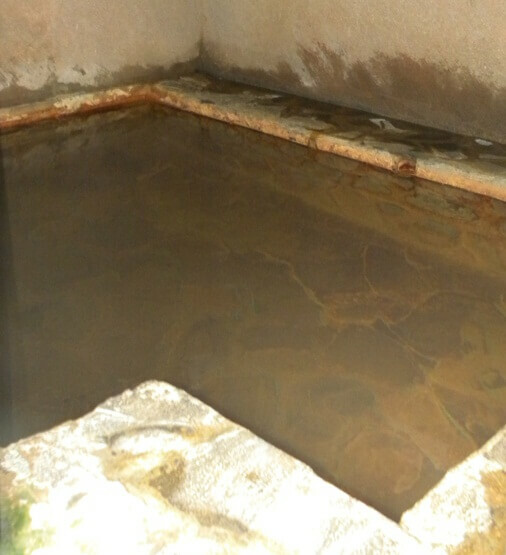 This hot spring pools are managed by citizens of Angseri in the form of Group Business of Wisata Alam Angseri, and has become a legal entity. After paying admission, visitors can go to the hot spring pools. This hot spring has two pool types, the public pools and private pools. Public pools are divided into pool for adults and pool for children. Public pool is located in the open space and has a large enough size so that visitors can move more freely. However, when visitors are crowded the movement can be a bit limited. Public pools have natural shades, green foliage, plants of tropical forests and natural waterfalls background (the size is not too big). In addition, there is also children's play area, although still a standard or basic. Meanwhile, to use the private pool, visitors will incur additional costs for each person (relatively less expensive). Shaped in cubicles, the private pool is surrounded by a protective wall with the hot spring in it. Each cubicle has a capacity of 4-6 people. The limited number of private pool, at the time of crowded, every visitor who wants to use the private pool have to queue patiently. Treatment of cleanliness and replacement of water is always done each after used by visitors. Visitors can choose to use the public pool or private pool. Visitors can breathe the cool air in the open space, enjoying the view of the green foliage and plant of natural tropical forests around the public pool. On the other hand, the impression of "more private and relaxed" together with the people you love could be a consideration to use the private pool. There is also a private pool that set aside for the purposes of treatment and therapy. Angseri hot springs Bali is highly recommended for hot spring lovers.